Strengthen in us, O Lord, the faith, by which the blessed Apostle Bartholomew clung wholeheartedly to your Son, and grant that through the help of his prayers your Church may become for all the nations the sacrament of salvation. Through our Lord Jesus Christ, your Son, who lives and reigns with you in the unity of the Holy Spirit, one God, for ever and ever. What Role Do the Apostles Have in the Liturgy? 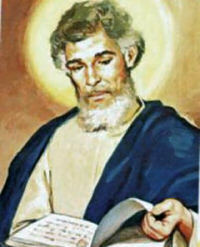 St. Bartholomew, a doctor in the Jewish law, was a dear friend of St. Philip the Apostle. Because Bartholomew was a man "in whom there was no guile," his mind was open to the truth. He went willingly with Philip to see Christ, and recognized the Savior immediately as the Son of God. After having received the gifts of the Holy Spirit on the first Pentecost, Bartholomew evangelized Asia Minor, northwestern India, and Greater Armenia. In the latter country, while preaching to idolaters, he was arrested and condemned to death. Historically today is the feast of Our Lady Health of the Sick. In St. John's Gospel, Bartholomew is known by the name Nathaniel (the liturgy does not always seem aware of this identity). He hailed from Cana in Galilee, was one of the first disciples called by the Lord. On that initial meeting Jesus uttered the glorious compliment: "Behold, an Israelite indeed in whom there is no guile!" After the Resurrection he was favored by becoming one of the few apostles who witnessed the appearance of the risen Savior on the sea of Galilee (John 21:2). Following the Ascension he is said to have preached in Greater Armenia and to have been martyred there. While still alive, his skin was torn from his body. The Armenians honor him as the apostle of their nation. Concerning the fate of his relics, the Martyrology says: "His holy body was first taken to the island of Lipari (north of Sicily), then to Benevento, and finally to Rome on an island in the Tiber where it is honored by the faithful with pious devotion." The Church of Armenia has a national tradition that St. Jude Thaddeus and St. Bartholomew visited the Armenians early in the first century and introduced Christianity among the worshippers of the god Ahura Mazda. The new faith spread throughout the land, and in 302 A.D., St. Gregory the Illuminator baptized the king of Armenia, Dertad the Great, along with many of his followers. Since Dertad was probably the first ruler to embrace Christianity for his nation, the Armenians proudly claim they were the first Christian State. Patron: bookbinders; butchers; cobblers; Forentine cheese merchants; Forentine salt merchants; leather workers; nervous diseases; neurological diseases; plasterers; shoemakers; tanners; trappers; twitching; whiteners; Gambatesa, Italy; Armenia. Often Portrayed As: elderly man holding a tanner's knife and a human skin; skinless man holding his own skin. In Sandwich, Kent, England, there is a St Bartholomew's Bun Race. The Bartlemas Bun Race for children takes place around the chapel of St. Bartholomew's Hospital on this feast day. Each participant receives a currant bun, while the attendants are each given a St Bart's Biscuit, which has an imprint of the hospital's ancient seal. St. Bartholomew's relics are in Rome, in the Church of St. Bartholomew-on-the-Tiber, or San Bartolomeo all'Isola (translated as: St. Bartholomew's on the Island). This site provides some pictures this church. Read the Life of St. Bartholomew from The Golden Legend. Since gingerbread is one food associated with this saint, read this short history of gingerbread. In England St. Bartholomew's day was a harvest feast for shepherds and farmers, celebrating their flocks. Athletic contests before feasting with England's favorite meat: grilled juicy mutton. This feast falls during the grilling season, so why not serve something from the barbecue. 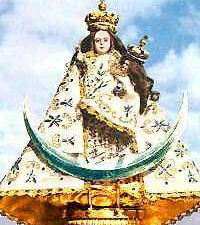 Our Lady Health of the Sick shrine is in the diocese of Michoacan, to the west of Mexico City. It was erected by the first bishop, the famous Vasco de Quiroga. The Indians of Michoacan, the Tarascans, were nomadic and impatient of all restraint. The bishop, in whose hands the entire project of civilizing the people was placed, set up the means and paraphernalia of civilization: the Church, hospital, asylums, workshops and tools, and the framework of administration. He laid out a hundred towns in a planned economy. He took every precaution to assure equity and justice, and he worked to develop their love of one another as children of God. He taught them about their Holy Redeemer and about His blessed mother. He erected the shrine of Our Lady of Health, through whose intercession they were to strive for health of soul and health of body. Every advance they made in virtue, every effort toward decent habits of hygiene and sanitation they were to offer as flowers in a garland to La Purisima. The statue which represented Our Lady of Health came from Europe. The Indians cherished it. They dressed it in elegant robes. They decorated it. They placed it in a chapel shrine. They duplicated it in the wood they carved out of trees. She became a favorite Madonna in western Mexico and northward into the United States. In many places throughout this great extent of territory she is skill a favorite Madonna. In some places her title has changed: In Chihuahua, Mexico, she is Our Lady of Chihuahua; in New Mexico, she is Our Lady of Santa Fe. The name has changed but the devotion and the statue are the same.